Did you ever find yourself pinching to zoom a paper map, or tapping and holding on an unfamiliar word in a newspaper trying to pop up a dictionary definition? It always ends in frustration, no? Not anymore. Not the second one, anyway: Meanings is an app that lets you use the iPhone’s camera to look up up real-world words in the fake-world dictionary. 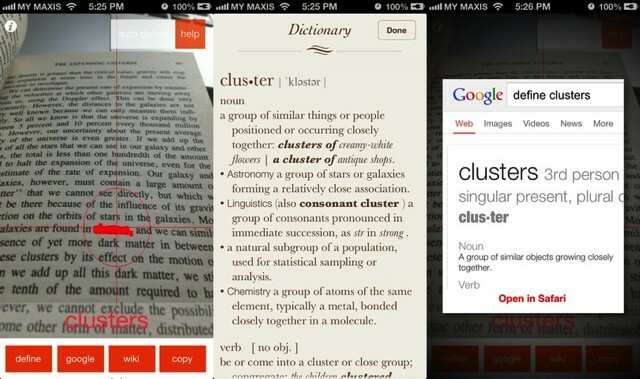 Meanings uses OCR in conjunction with the iPhone’s camera to look up words in the built-in iOS dictionary. You point the camera at the page, tap the word and it highlights it, grabs it and shows you a definition. And if you have an internet connection, you can also define it using Google, or look it up in Wikipedia. It’s pretty neat, and even if it didn’t use the camera, an app just for looking up words is handy thanks to the fact that iOS doesn’t actually have a standalone dictionary app. It’s also just $.99, and has a nice, iOS 7-ready flat UI. What’s not to like?